My friend @meresnuttykitchen cannot have eggs, so these pancakes are inspired by her because they are EGG-FREE pancakes! 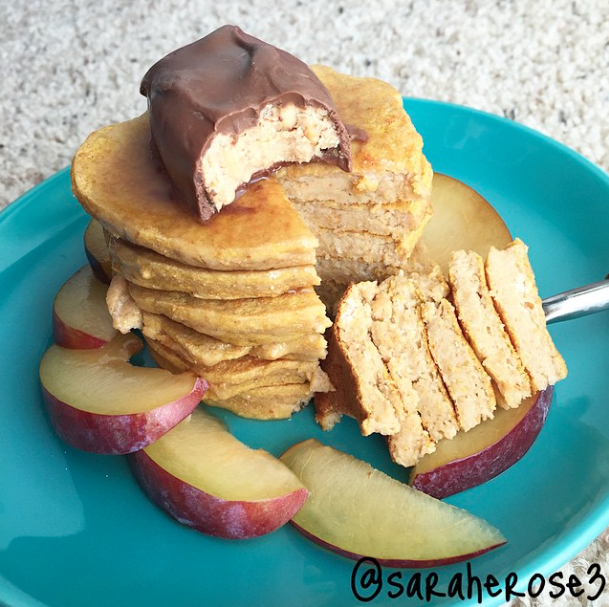 These Egg-Free Peanut Butter Marshmallow Protein Pancakes are so moist and delicious! I loved the texture. I topped them with a Russell Stover Crunchy Peanut Butter Egg (yeah still left over from Easter 🙈) and Walden Farms Pancake syrup. And surrounded by a sliced plum! Mix all of your own ingredients then cook in a pan over medium-low heat. Home from class, and it’s time for a snack! I decided to whip up some Extra Peanut Butter Cookie Dough topped with French vanilla almonds and extra whipped reddi whip. Da bomb. This one kicks my other cookie dough recipe’s booty. Blend all of your ingredients – you can use a hand blender or an immersion/hand blender. Then eat! 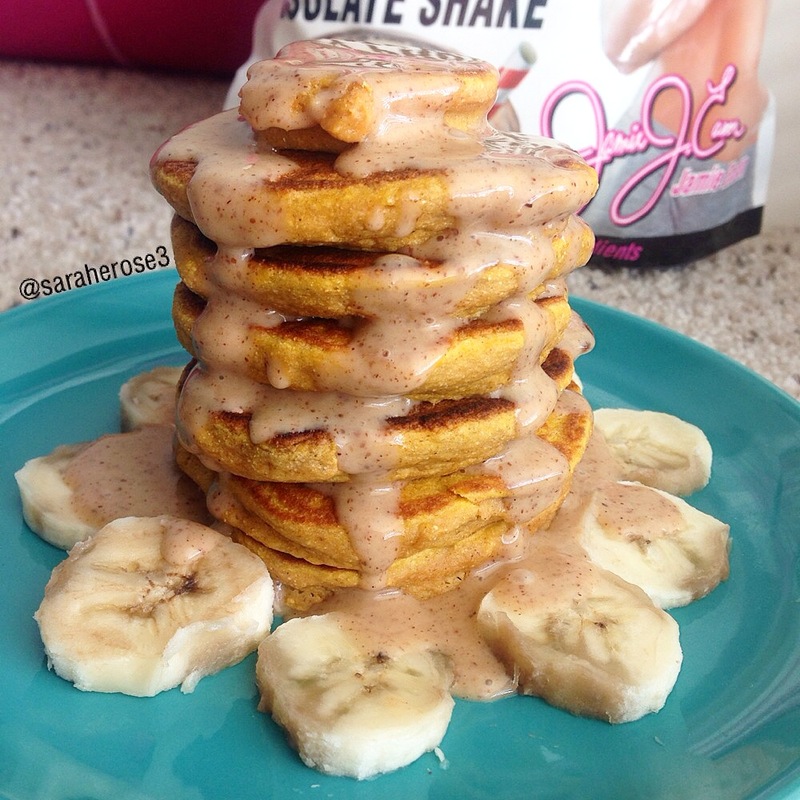 It would be fun to add chocolate chips! This was my caption on Instagram when I made this. I felt it was necessary to share. The Chicago theatre community has been hit HARD lately with deaths. The show that I was supposed to be in right now (but since I left Columbia for a break, bowed out of) lost its director this morning. Sheldon Patinkin. You all should look him up. He basically was one of the originals in the finding of the theatre community here. Incredible man. He lived a great life. Today, I sing Into The Woods music for this brilliant man. 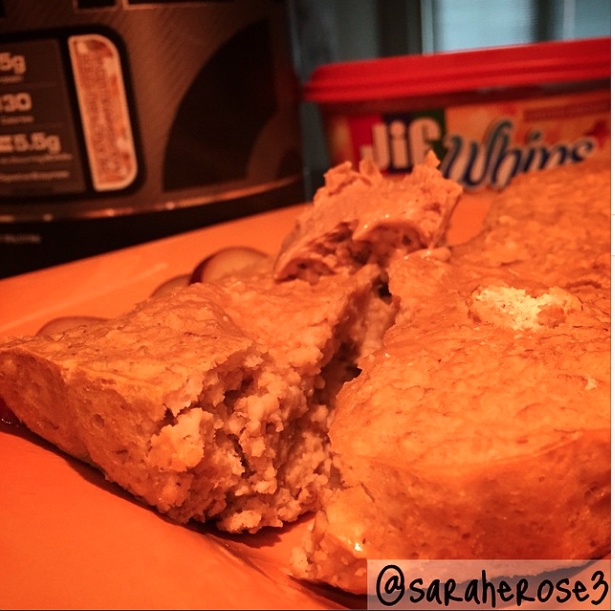 I made this for breakfast: Pumpkin Spice Peanut Butter Marshmallow Protein Oat Cake topped with Pumpkin Pie Spice Jif Whips and surrounded by half of a sliced plum. Preheat oven to 375F. Mix all of your ingredients then put in a greased loaf pan (I lined mine with parchment paper so the cake will pop out easier. You can use any type of pan that you would like!). Bake for 25 minutes or until the cake is cooked through. Note- the cake is going to be moist from the pumpkin. I love it. 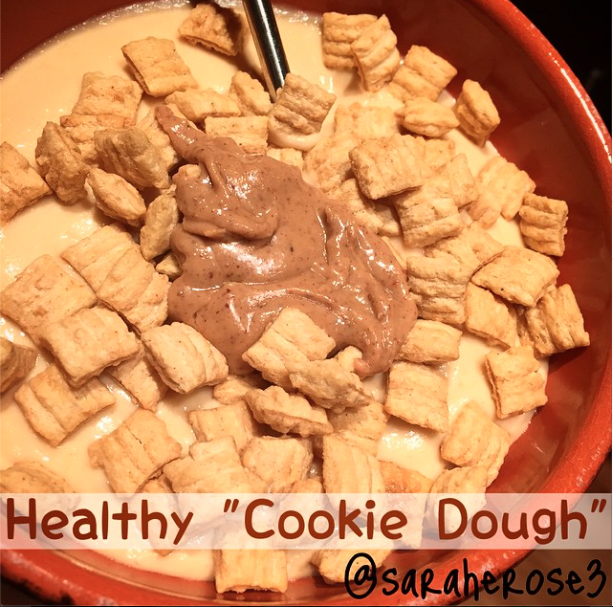 I tried to make some Healthy “Cookie Dough” tonight! Secret incredient: chickpeas! The mix was thinner than I had hoped, but holy cow- it tasted so good! 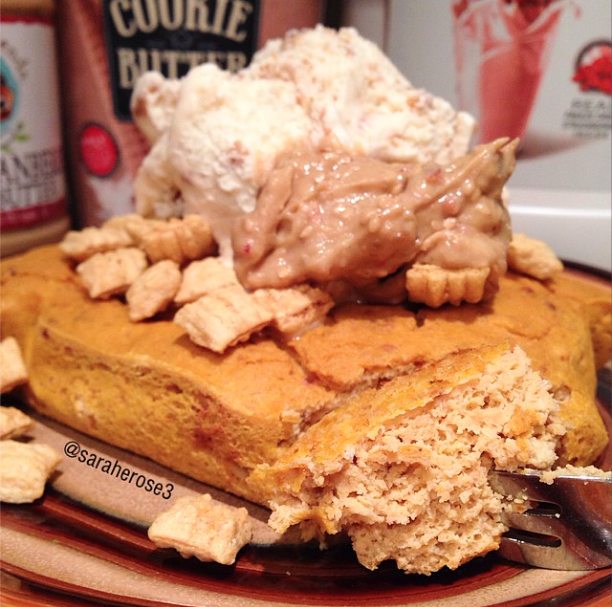 I used my vanilla Jamie Eason Lean Body For Her Protein Powder in this! 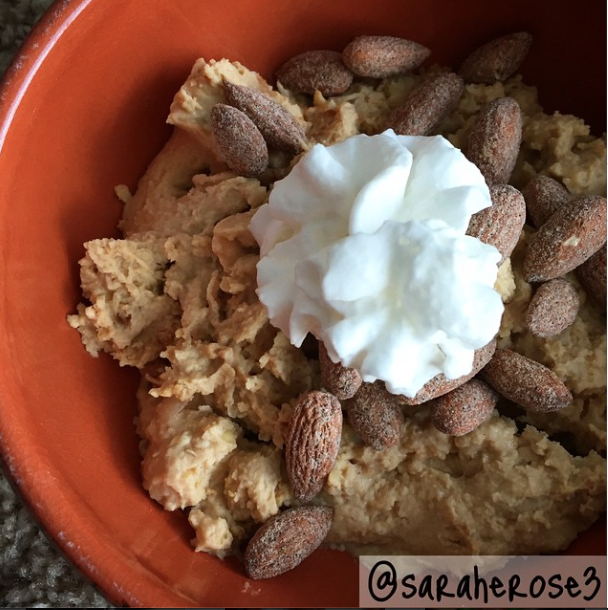 This recipe is high protein and high fiber! Try it, and let me know what you think! Blend all of your ingredients. You can also reduce the liquid to make it thicker! Mix all ingredients, and cook in a greased waffle maker. 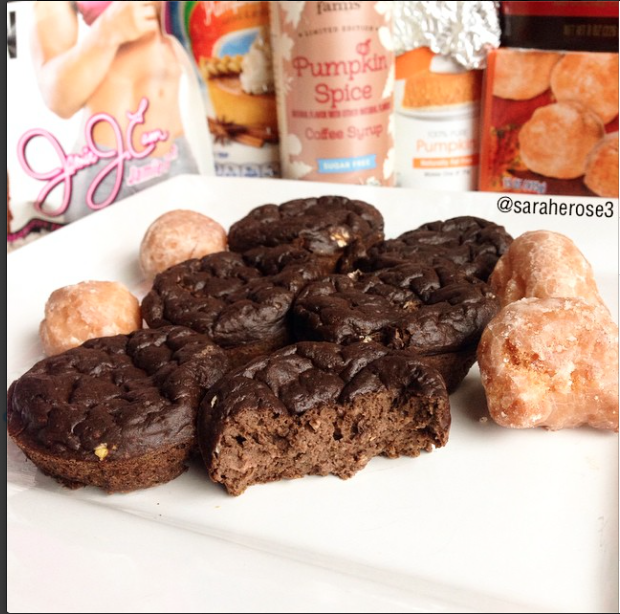 I made Double Chocolate Pumpkin Spice Protein Muffins using Jamie Eason Chocolate Lean Body For Her Whey Protein Isolate Powder. When adding pumpkin purée to recipes in a large amount, it makes them suuuuper moist. I’m torn- I love it but don’t, at the same time. Try these out, and tell me what you think! These are based off/inspired by a few of @kimhoeltje‘s cookie recipes. Check her out! Paired these babies with some Pumpkin Spice Doughnut Holes. Cinnamon Preheat your oven to 350F. Mix all of your ingredients. Bake in a greased muffin tin for 20-22mins. Your muffins should come out pretty moist on the inside! These were definitely the most aesthetic porncakes I have made yet. I’m dang proud of ’em! And I wish I had them again….#sad. Mix all of your ingredients, then cook in a greased pan/skillet on the stove (medium-low heat). Once cooked & starting to brown on one side, flip and repeat on the other side. I didn’t measure the syrups – I just added until I liked the consistency!